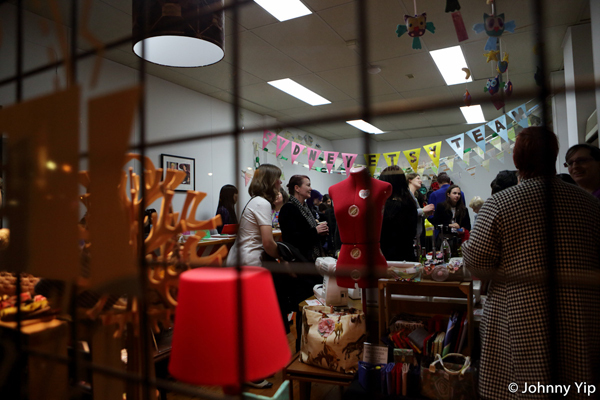 FK chats to Melissa of newly opened, Sydney creative space, Sew Make Create! Tell us about your creative space Sew Make Create and what things we can expect to discover & do. 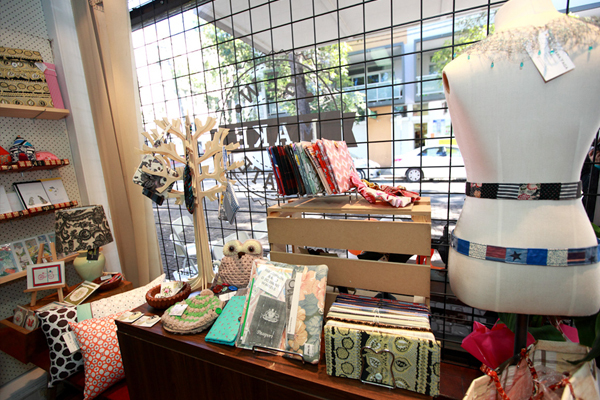 Sew Make Create is a workshop and retail space in Sydney’s creative suburb of Chippendale. We hold casual, creative classes and social events for children and adults. Workshop classes teach a range of skills that are related to design, art and craft such as sewing, crochet and card making. Customers are also welcome to use the space to work on their own personal projects or hire a sewing machine on an hourly basis. 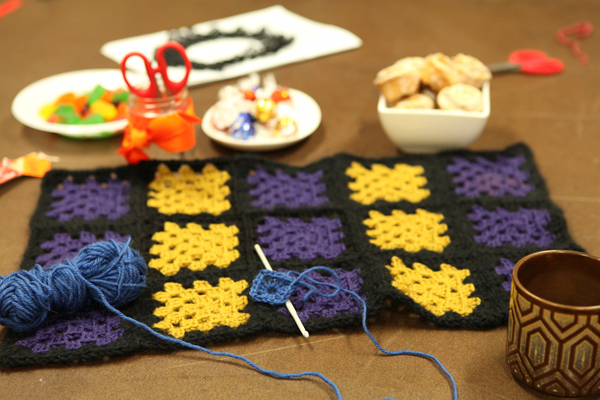 The workshop welcomes everyone to gather and work amongst others over a cup of tea and have a creative experience. 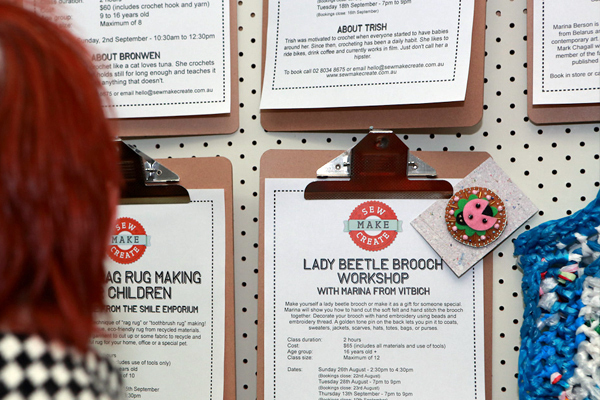 To compliment and inspire the workshop there is the Sew Make Create shop. It promotes local Designers and Artists by selling a range of Australian made products including fashion accessories, art, stationary and homewares. Sew Make Create aims to encourage learning and creativity through providing the right environment, assistance and facilities. How did you come about opening Sew Make Create and what is your background? Back in 2010 I had the idea of a shared workshop space where sewing machines were available for hire and people could have access to a creative environment. After studying Graphic and Textile Design at university I worked in Sydney’s fashion industry for many years. I started my own self-titled, accessory label in 2009 designing and creating each piece myself using mainly vintage and recycled fabrics, selling at local markets and online. I have always wanted my own studio with a retail shop. With encouragement and planning from my husband Sew Make Create became a reality. 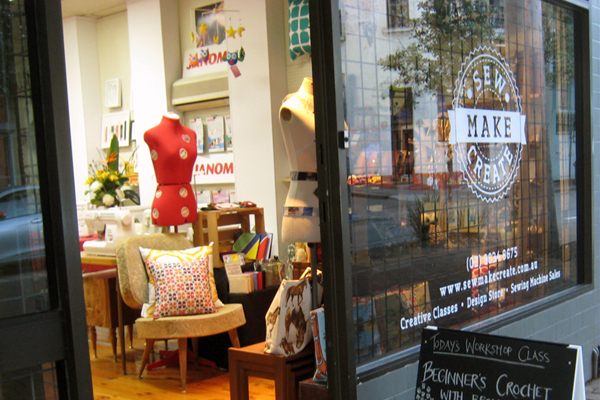 Sew Make Create lets me do everything in one shop – Design, make and sell my own designs, promote other local Designers and Artists, hire out sewing machines, and offer creative workshops where people can learn new skills and share their love and passion. 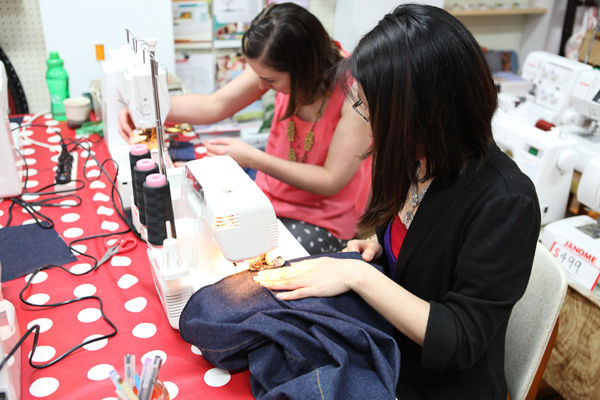 There seems to be a lot happening at Sew Make Create! What else can we expect to find, what labels & product do you stock and what are you always searching for? The Sew Make Create workshop has a fabric cutting table, sewing machines, a wall of off-cut and scrap fabrics to recycle, a small kitchenette and our workshop blackboard timetable with workshop schedule. Our teachers are a mix of professionally trained and craft enthusiasts, we’re always on the look out for new teachers that want to share their skills and favourite hobby. We are an authorised Janome sewing machine dealer so we have machines on display for people to try or they can drop off their machines here for servicing. Our Australian Made Design Store is filled with unique, handmade, locally made products including original artwork by Bea Bellingham of Pelican Pirate, jewellery by Jacqueline from Whimsy Milieu, greeting cards by artist Gabby Malpas and cushions from Rochelle from Charlee le More. At Sew Make Create we are happy to promote and support local Designers and Artists, we get excited about new products and brands hoping we can help them by showcasing their work in our shop. Who are the team behind Sew Make Create and what are their roles? Besides myself, team Sew Make Create is my partner in crime, my husband David and our quirky dog, Pepper. I spend my days managing the workshop and shop, planning more classes, finding new creative ideas and events to share, sourcing new Designers and Artists, working away on the sewing machines and have the pleasure of meeting new customers that drop in each day. David works behind the scenes on the business, running our website, doing all our graphic design work, films and shoots our events and is a very useful handyman around the shop. Pepper is our friendly and affectionate shop dog, the shop is never quiet with her running around. She greets our customers in hope to get a pat or cuddle. What do you love most about running Sew Make Create? As cliche as it sounds, the Sew Make Create shop is a real dream come true, any Designer, Artist or Creative would understand. Sew Make Create is a unique retail space that has endless creative possibilities, from workshop classes to social events. Every day I am amazed by the people I meet whether they are the Designers and Artists that contribute to the shop and workshop or people that just drop into the shop. Each person has his or her own unique story to tell. I am constantly inspired each day, what more could I ask for? What inspires you about your surroundings and what other aspects about Chippendale do you love? David and I chose the Sew Make Create shop because it was a run down terrace shop with great character that needed a bit of love, renovating and transforming it has been an amazing experience. We are located in a part of Chippendale that is a conservation area, we love the story that comes with the building and the fact that the council wants to preserve it. 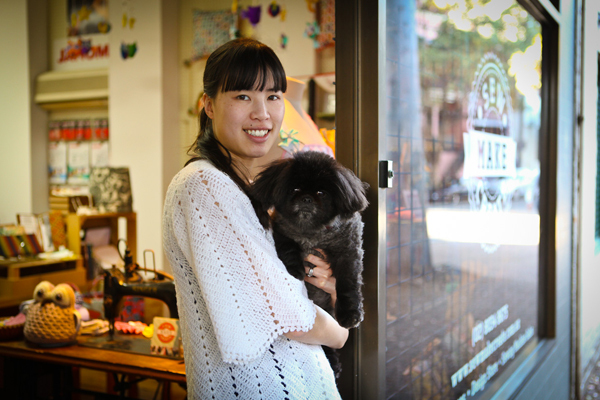 Chippendale is filled with creative businesses and locals. You can find great eateries, bars, galleries, design businesses, creative studios and more down little lane ways. Chippendale has an amazing creative vibe. Being a new business and new to the area we received the warmest welcome from locals and local business owners, there is a great sense of community here. 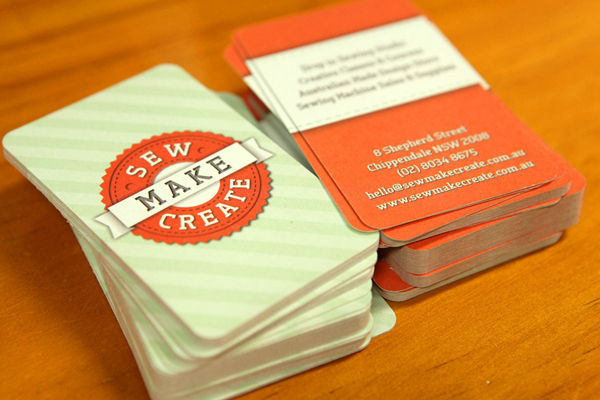 We love that the locals are excited about Sew Make Create and are very supportive. Being a team of 2 people (and a dog) we always find that there just aren’t enough hours in the day! Initially we were renovating the shop while setting up a new business and literally living and breathing it 24 hours a day. Now that the shop is up and running it can be hard to separate my work life from my personal life, because I have the luxury of doing what I love. 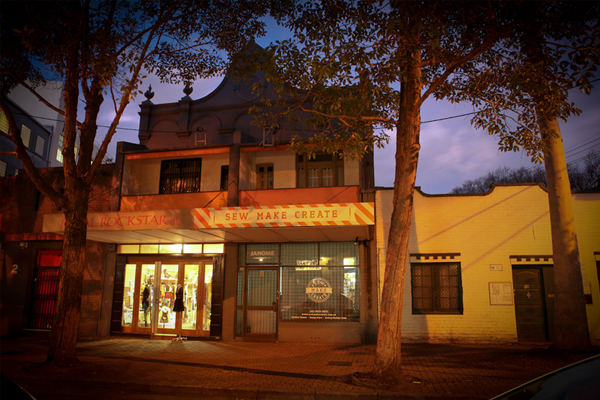 The concept of Sew Make Create was always going to be new retail concept and there was always the risk that in reality it might not work. But luckily we have so many ideas for Sew Make Create, our Teachers, the Designers and Artists, our family and friends, the locals and our customers are constantly supporting us, giving us new suggestions and great feedback. 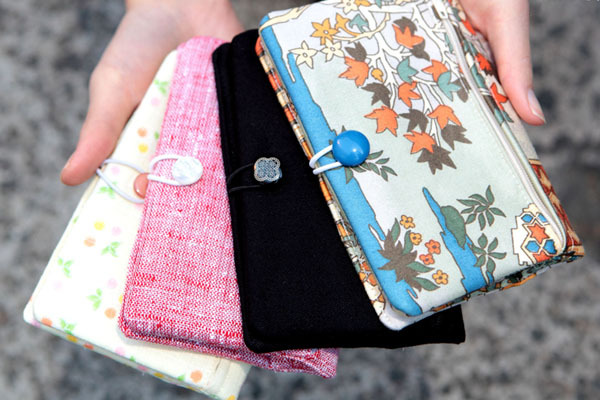 What new things do you have planned for Sew Make Create for the rest of 2012? Having only been open for 2 months with such an awesome response to our workshop classes and shop we want to do more and more! Definitely more classes, there has been a demand for sewing workshops. The workshop is also meant to be multi-functional space and we have hosted a craft party and just started running our Handmade Business Stories afternoon tea where creative people can meet and get inspiration from each other, we really want to become a community based venue. Discovering and showcasing new Designers and Artists will make sure our shop is every changing and growing with new things to see everything our customers drop by. 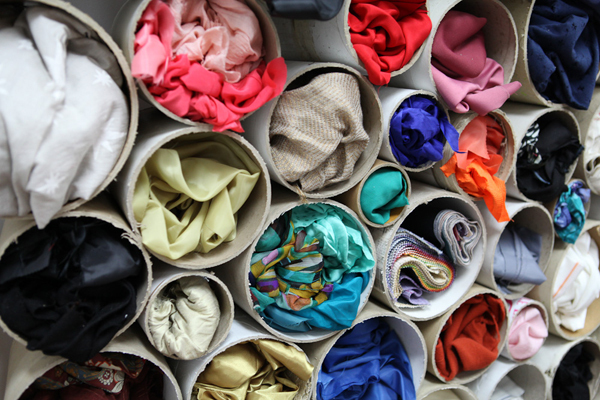 Sew Make Create aims to be an environmentally conscious business and workshop. At the centre of is all we hope our customers will always have a unique, creative experience. 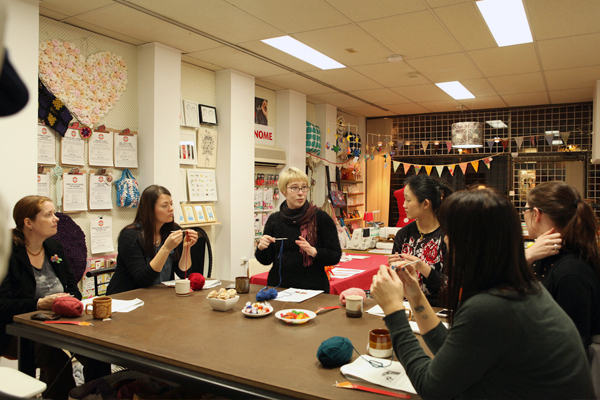 i’ve done 2 crochet classes at sew make create, and highly recommend them! such a great idea and a lovely space to get your inner-craft-geek on! Thank you Finders Keepers for the feature! We are so chuffed to be shown on here amongst so many other amazing, creative, inspiring businesses in Australia. The Sydney community has been overwhelmingly welcoming to our new concept store. Keep up the creativity Sydney! Thanks for the mentions Fox and Beau and Sarah!